War breaks out across the stars as the Klingon and Romulan Empires fight for supremacy, with the crew of the Enterprise caught in the middle! Don't miss this epic, all-new story set after the events of the blockbuster movie Star Trek Into Darkness, overseen by Star Trek writer/producer Roberto Orci! 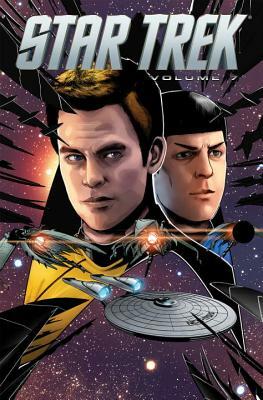 Mike Johnson wrote the Star Trek ongoing series for IDW and currently writes the sequel series Star Trek: Boldly Go, both set in the Kelvin timeline of the films by J.J. Abrams and Justin Lin. With fellow Orci/Kurtzman employee Tim Jones, he also wrote Star Trek: Nero and Star Trek: The Official Motion Picture Adaptation. His other credits include Superman/Batman and Supergirl for DC Comics and the miniseries Eight for Dark Horse, with artist and co-writer Raphael Albuquerque.